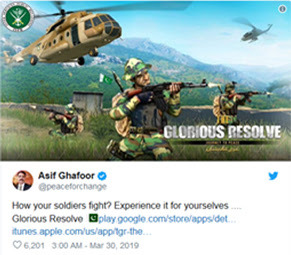 Pakistan: That on Saturday 30th March 2019 Pakistan's Inter Services Public Relations (ISPR) officially launched a 3D game having also a quality graphics with all the compatible advanced game features as name of "The Glorious Resolve" has a slogan as Journey To Peace. In accordance of said game, Players will not only usage of Army / Military weapons but they also counter the hostile takeover in his concern region. 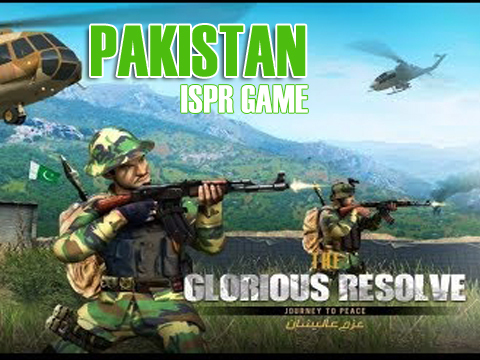 This Pakistani shooting game 'The Glorious Resolve' also bring together LEAs i.e Military / Army, Navy, Air Force and other sister agencies in order to combat against terrorism and fight for wholly sabotage the such bon of contention. In which the said LEAs will display their best expertise all over the country Pakistan. Why are you waiting for, pull up your socks and be ready to enter in real action adventure against terrorist and enemies. Another good news is that this game 'The Glorious Resolve' has also been published - uploaded on Google Play Store in both version i.e iOS & Android devices so you can directly download the same through Google Play Store without any delay. Despite of above, 'The Glorious Resolve' having also a variety of 3D locations with mountains, hills, under ground tunnels, slumb - desert areas where the players can use Arms - Ammunition, Missiles, combating air strikes as well with the help of throwing hand grenades to reduce the power of their enemy in order to defeat him / them completely to win the game.